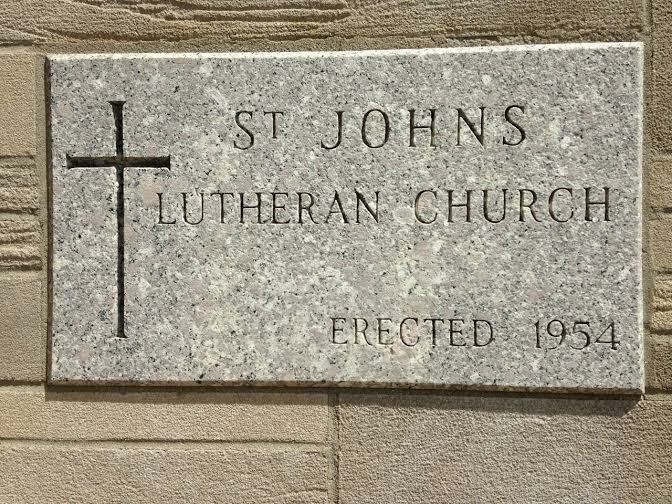 St. John’s Evangelical Lutheran Church formed in the years 1858-1860. Services were probably held in the homes of congregation members until the first structure, a log church located southeast of the crossroads of State Route 118 and Oregon Road, was built. 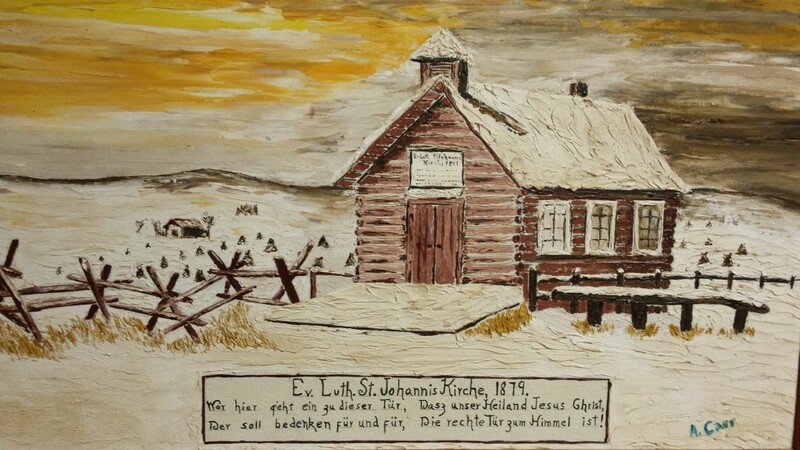 Artist depiction of the first log church. Painted by Arch Carr circa 1966. 1861: The constitution was drawn up and adopted. July 29, 1863: Pastor George Heintz held a congregational meeting and the following church officers were elected: Elder, George Weier, 2 yrs. ; Fred Sielchott, 1 yr.; Deacon, Wm. Regedanz, 2. yrs., and Fred Berlin, 1 yr.; Treasurer, Wm. Regedanz; Secretary, Fred Berlin. 1864: Purchase of the first German Hymnals. 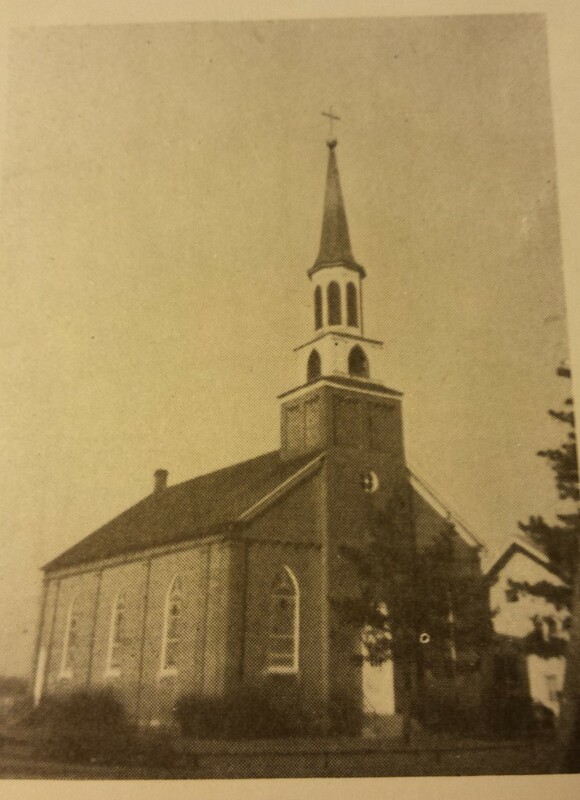 1866: The church was incorporated as the Evangelical Lutheran Church of Hopewell Township. Late 1860’s: Purchase of first church bell. 1873: Construction of old parsonage. Building committe: Adam Siebert, John Frahm and John Riese. 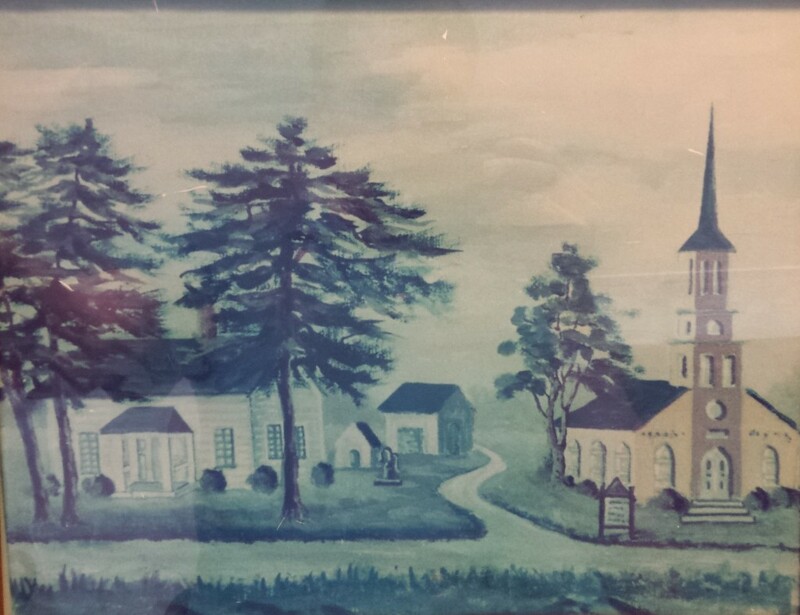 Painting of second church and first parsonage. Painted by unknown artist circa 1950’s. The above painting captures the second church (right) and first parsonage (left). The first parsonage would then become known as the janitor’s house. 1881: Construction of the second church building on the site of the present Parish Hall. The land was purchased from William Pierstorff. 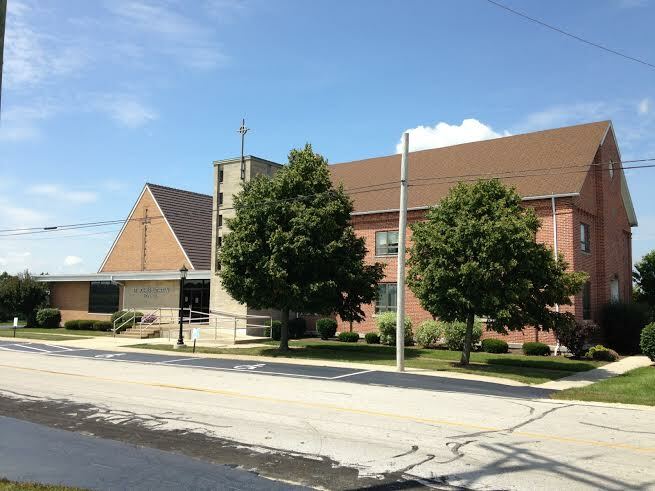 The building was 40 x 60 feet and erected at a total cost of $5,016.52. 1909: Installation of first church furnace. 1913: First meeting minutes written in English recorded by secretary, Arnold Hoenie. 1914: Installation of art glass windows at a cost of $50.00. 1915: Installation of first sidewalks around the grounds and acetylene lighting system. 1918: Construction of the second parsonage at the cost of $3,785.84. 1920’s: The replacement of German language with English. The German language was the basic language, and all who were instructed in the Word of God were instructed in German. 1937: Purchase of the pipe organ in connection with 75th Anniversary of St. Johns. Photograph of the second church with the second parsonage to its north side. Photograph of the third and present church. 1942: Establishment of the Improvement and Building Fund. Palm Sunday, 1943: Vote passed to build the third (and current) church and convert the old church into Sunday School rooms and the Parish Hall. 1951: Building committee appointed. Members: George Luth, Irvin Meyer, Howard Frahm, Ole Sites, Urban Hoenie and Cletus Frahm. 1954: Laying of new church cornerstone. Total bids of the construction contracts were $75,754.00. The pews, pipe organ and altar were transferred from the old church. September 4, 1955: Dedication of the new church to the service of the Triune God during the pastorate of Rev. Clyde P. Miller. Today: Since its construction, the third church has had renovations and improvements of its own.